Portuguese architect, Miguel Marcelino has renovated an apartment in Odivelas in the Lisbon metropolitan area. He didn't stop at just making structural improvements but sought to give the home a new soul. Miguel Marcelino, Portuguese architect has taken on Odivelas, a city with a population of about 59,000 in the Lisbon metropolitan area. The original apartment lacked heart and soul, one of those typical, drab units built some time after the middle of last century, with too many walls and very little natural light. 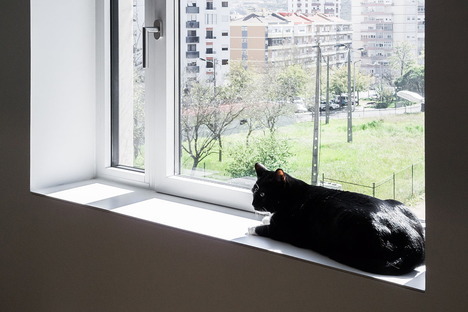 The architect's design, first of all, redefined the spaces by knocking down unnecessary walls to connect the living zone, kitchen, office and balcony facing south-east. By doing this, Miguel Marcelino brought in light and made the rooms more dynamic. He stripped back the pillars and beams to bare concrete, which sets up a pleasant visual tension with the blond wood of the floor and the white walls. Bespoke solutions like the book niche in the wall and the blond wood folding door assure excellent exploitation of the 86-square metre usable area. Exposed shelving adds a touch of a colour in the open kitchen that communicates with the living zone. 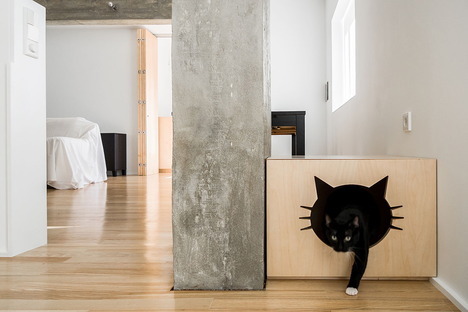 But the owners' splendid cat is the home's real soul and his presence completes the interior design - and he even gets his own built-in cat house complete with an entrance in the form of a cat. The refurbishment project by Miguel Marcelino in Ovidelas underscores the importance of creativity in renovations, devoid of overdone minimalism, to craft a warm, friendly atmosphere even when it's part of an anonymous residential context. House on a warehouse, project by Marcelino.